2015 has proven to be wild ride for investors, with game-changers such as the passing of Title III of the JOBS Act in October, Fundrise’s launch of a new “e-REIT” and the crowdfunding fraud suit filed by the SEC against the company Ascenergy – to name just a few. As this year’s events have shown, crowdfunding and other forms of alternative finance are quickly redefining the capital market as we know it, by granting investors unprecedented access to previously exclusive markets. And with the passage of Title III, the crowdfunding’s reach has been expanded even further to include non-accredited investors. Under the new rules, non-accredited investors can participate on crowdfunding platforms by helping companies raise up to $1M in a 12-month period. So how will this impact existing platforms that already offer investment opportunities to accredited investors? Platforms that were operating before Title III came to fruition can keep providing their accredited investors with pre-vetted deals. The difference, however, will now lie in the platforms’ vetting process. Title III allows for companies to post projects directly on crowdfunding platforms, so the vetting of deals will be largely done by investors instead of the platforms pre-vetting the deals before offering them on their site. EnergyFunders, for example, the first platform to offer global and national participation in the “small oil” market, plans to continue offering pre-vetted deals to its accredited investors – the method that led to $1.8 million in deals since our company’s recent launch. But we also plan on expanding a new site at the same time, specifically a Title III compliant platform for non-accredited investors. 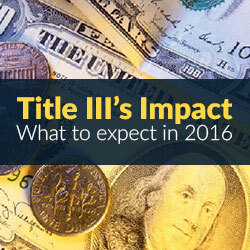 But even more so, what all will Title III entail, and how will we see the crowdfunding change as a result in 2016? Investor eligibility will be simple. If you earn less than $100,000 and your net worth is less than $100,000, then you can invest the greater of $2,000 or 5% of annual income or net worth. If annual income and net worth are equal to or over $100,000, investors can participate at 10% of their annual income or net worth, whichever is less. If you are an accredited investor, you can also participate in platforms operating outside of Title III that cater only to accredited investors. The rules will promote niche platforms. SEC rules require that Title III platforms for non-accredited investors provide channels to discuss investment opportunities listed on the platform. For Title III listing platforms, this means that knowledgeable industry professionals may comment publicly on the viability of certain projects being offered. Without the platform itself vetting projects, this public vetting process is critical. In fields like energy, there are numerous, well-educated professionals who may not make the cutoff to be accredited investors but nevertheless wish to spend their time helping vet projects and invest in Title III accessible projects. Many accredited investors may also enjoy the benefit of diversifying with smaller buy-ins across many crowdfunding projects and enjoy finding the good deals, eliminating the bad deals, and sharing their opinions with other would-be investors. In this manner, the wisdom of the crowd guides investments on a Title III platform for non-accredited investors. But, it’s a crowd. It’s not a mob. On industry specific crowdfunding platforms, the wisdom of the crowd will include many diverse technical and non-technical professionals. In energy, for example, multi-disciplinary teams are needed to vet projects. A platform like EnergyFunders attracts engineering, geology and legal professionals to the site, all of whose skill sets are necessary to properly vet a project. The opportunity to contribute to smaller projects in their niche skill sets previously reserved for multi-billion dollar employers will be a strong draw for oil and gas professionals particularly. In this manner, the specialized crowdfunding platforms can emerge as knowledge hubs in 2016. Rather than having one platform that covers real estate, oil and gas, bio-technology, app start-ups, and every other field under the sun, crowdfunding experts can expect to see the emergence of industry specific platforms like EnergyFunders which focuses on energy, starting with oil and gas. With the passage of Title III, crowdfunding now has power to completely disrupt the status quo of investments. So today, the question is no longer if platforms have long-term viability, but how platforms are going to permanently change the entire industry for good. Crowdfunding Under Title III of the JOBS Act: Where Do We Stand Today? 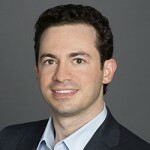 Philip Racusin is the Chief Executive Officer (CEO) and co-founder of EnergyFunders, an online marketplace that connects qualified investors to nationwide, small cap oil and gas projects managed by proven operators. A seasoned litigation attorney, Philip currently serves as a senior associate of Pagel, Davis & Hill, P.C., where he has successfully represented clients, ranging from individuals to large companies, in a variety of legal disputes for nearly a decade. He also launched several startup ventures prior to EnergyFunders, including a legal technology company that totaled over 50,000% ROI in one year. Both a savvy entrepreneur and accomplished litigator, Philip fuses legal expertise with astute business knowhow to navigate the oil and gas industry’s regulatory waters and carefully pre-vet each project offered through the site.